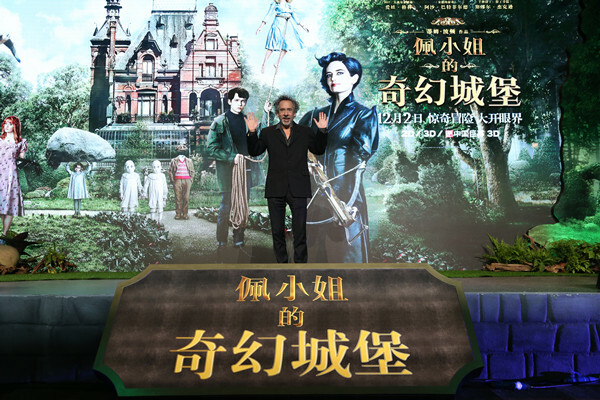 Director Tim Burton has brought his latest film to China, and the name of it is a bit of tongue twister: "Miss Peregrine's Home for Peculiar Children." At a press conference held in Beijing on Tuesday, the director talked about what inspired him. From characters with peculiarities to an atmosphere built on old photographs, Burton's new film "Miss Peregrine's Home for Peculiar Children" takes a lot of content from the director's own personal life experience. "As a teenager, I didn't feel like I could quite fit into things and I didn't feel like was a part of the way that I grew up," Burton said. "You feel like you are crazy or you feel like you don't fit in and, or you are seeing things that aren't there, monsters or whatever. Also that feeling of, as a child, feeling peculiar, and I knew that other kids felt that way." The film centers on Jake, played by Asa Butterfield, a disenfranchized teenager who learns that stories his grandfather told him, of peculiar people he had met, are actually true. The movie also features Samuel L. Jackson in the role of the villain, Barron; Ella Purnell as Emma, a girl with the unusual ability to control air; and Eva Green, who plays the titular character, Miss Peregrine, who runs the home for peculiar children. Burton describes Green's Miss Peregrine as "a fantasy version of a head mistress." "It's the kind of a head mistress that I would have liked to have had, and I think a lot of kids would have liked to have had. And she's still got a strength to her, which was important. In the book, the Miss Peregrine character, you don't quite understand what she is, but with Eva she's got that beautiful, strong inner-strength that was important for the role," Burton said. The film is based on a novel of the same name by American author Ransom Riggs, who collected old photographs, something Burton can relate to. "I collect old photographs myself, and there's something that is so beautiful about, when you look at a photograph, how it tells you a story, but it still has some mystery to it, some motion, sometimes humorous, sometimes mysterious. So, I really love the way he constructed the book. Movies are obviously visual, so to try to capture the spirit of some of those photographs was something that was important to me," he said. "Miss Peregrine's Home for Peculiar Children" opens in Chinese theaters December 2.